To give proof of their power over the rich and renowned, Anne’s enemies would not let her die in secret. On the day of her execution, she was brought to the stake in a chair—not being able to walk because of the cruel effects of the torture. Just before the fires were lighted, a priest gave a sermon, and Anne Askew openly answered his every statement. If he spoke truth, she approved, and if he spoke error, she firmly announced, “he speaketh without the Book.” As the fires were being prepared, the lord chancellor sent a message to Anne Askew, offering her the king’s pardon if she would recant. She refused, saying, “I came not hither to deny my Lord and Master.” The letter was then offered to three others, who were also at the stake, but they all refused in like manner, continuing to cheer and exhort each other. 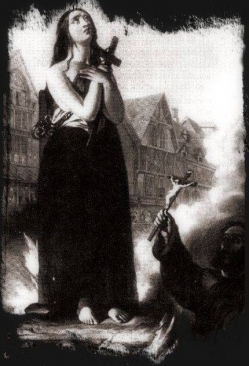 Thus were this noble lady and her companions encompassed with flames, as holy sacrifices to God and His truth. Adapted from John Foxe, The Book of Martyrs (London: Pickering & Inglis, no date): 140-144.